The Accella Computer Workstation & Activity Table is attractive and modern. 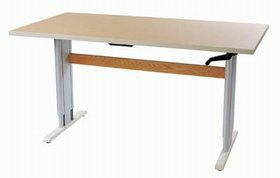 This height-adjustable table is ideal as a wheelchair accessible activity table or computer workstation. An easy to turn hand crank that folds underneath allows each user to position the table to the appropriate height. Ideal as an ADA compliant computer workstation for assistive technology and school computer labs. Metal base with almond powder- coated feet.